Use tile adhesive to stick the tiles to the surface, then when completely dry use a grout to fill the gaps between the tiles. Various types of adhesive and grout are available. 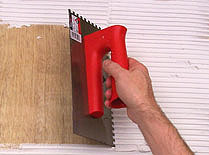 Ready mixed adhesive/grout is less hassle, less messy, a bit more expensive, but dries quite slowly. I tend to use it on small jobs, for which you can buy a combined adhesive and grout which saves buying both. Powdered adhesive which in my view is much superior(used by professionals) is mixed with water, dries very quickly and doesn't slip so much when wet. A bit more messy for mixing and cleaning up afterwards, but it is very hard wearing. You'll need an adhesive spreader which has square shaped grooves cut into its edge so that when you spread the adhesive you should end up with ridges of adhesive that you can push the tile on to. Apply small sections of adhesive at a time. If you aren't going to complete the job in one go scrape off any surplus where you haven't tiled. If you let that dry you'll have to chip it off with a hammer and chisel later which is really hard work. Ensure the adhesive is thoroughly dry before grouting. 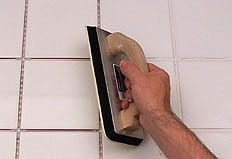 Use a grouting float or squeegie to force grout into the spaces between the tiles then use the float to squeegie off any surplus, working quickly before it starts to dry. You may also find a damp sponge helpful with this. Once the surplus is removed run down the gaps with a finger or grouting finisher to get the grout lines nice and smooth, and again take off any excess with a damp sponge. When fully dry polish the tiles to get rid of any fine cloudy residue.